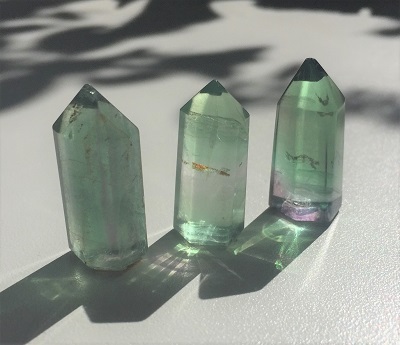 Stunning green with purple wispy bands of colors rainbow Fluorite Polished mini tower. A highly protective stone, this Fluorite mini tower energetically supports the feelings and courage to be open to different point-of-views and to be conscious of guarding your boundaries. 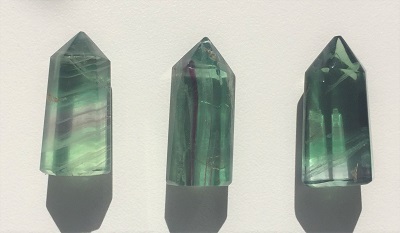 These Fluorite towers support energetic introspective and creative musings that allow for reflection and study while patiently waiting for new visions. 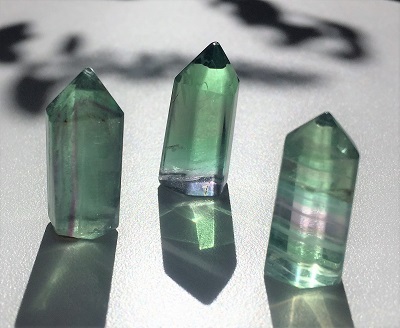 Fluorite grounds and integrates spiritual energies, promotes unbiased impartiality and heightens intuitive powers. 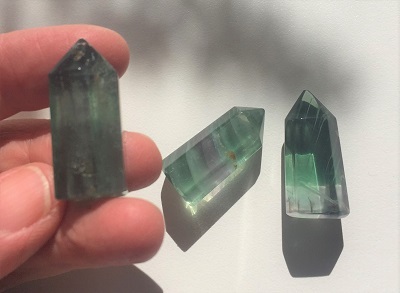 Fluorite may make you more aware of higher spiritual realities and may quicken a spiritual awakening. Fluorite also dissolves illusions and reveals the truth. Fluorite may help one overcome chaos and reorganize the physical, emotional and mental bodies.